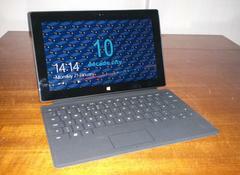 I have picked up a Microsoft Surface RT for my device lab and have spent some time using it. The concept behind the device is interesting, combing a touchscreen with a keyboard and mouse is required to make Windows 8 viable but, despite the promise, I was distinctly unimpressed with this device. The device is well built although, as the casing is mostly metal, it is too heavy for comfortable one handed use - especially as the narrow aspect ratio means that, if you hold it near one end the centre of gravity is too far from your hand and the leverage increases the perceived weight. The obvious feature of the hardware is the way it is designed to work on a flat surface like a laptop. A stand flips out from the back of the device and the thin "Touch Type" keyboard that acts as a screen cover folds out in front of the screen. This works well on a large enough flat surface but it has to be on a flat surface, it's not practical to use it on your lap. With the keyboard removed and using the stand it does make a good tabletop media player. The "Touch Type" keyboard is just about good enough for touch typing but, as there's no tactile feedback from the keys, you really need to have the key press sounds turned on and I found these got very annoying very quickly. I suspect the "Type Cover" keyboard would be better for typing but, at £109.99 it is very expensive. The touchpad mouse works well and really is needed for the Desktop interface. The screen is good and clear, it's not as good as a "retina" screen but more than good enough. There are two cameras that cope well with low light and seem to be optimised for video conferencing - they don't produce as high quality stills as a good camera phone. The rear camera is angled to be horizontal when stood on the stand which means it's not so intuitive when holding it in your hands and, coupled with the fact that when folded behind the screen the keyboard covers half the camera, it's clearly not designed to be used as a point-and-shoot camera. Battery life seems to be pretty good but I have noticed the device runs hot at times, especially when charging or playing media. The charger uses a connector that is very similar to Apple's MagSafe. There is a microSD port, a USB port which allows you to use flash drives, and a microHDMI port. I have noticed that it seems to lose internet connection even when it says it's connected to a WiFi network. I don't know if this is a known issue or if there is a fix for this but it's happened since Windows update has run. Much has been written about Windows 8 and I'll try not to go over what others have covered in more detail but I can't ignore some aspects in this write up. Firstly there is the well documented split personality of the (Metro|​Modern|​Tiled) interface and the Desktop interface which this device addresses by providing both touch and mouse inputs. The main problem I have is how each interface has been forced into working with the less optimal input. On the Desktop interface the touch event has had to be overloaded with a number of different distinct interactions, namely: left click, right click, double click, hover, and click and drag. Understandably, it's not unusual for the operating system to misinterpret touch events which can provide some unexpected behaviour. The Tiled touch interface works relatively well but there are a few things I have issues with. Again the problem seems to be overloading gestures. There are a few places where I have encountered this but it's the swipes from the edges that seem to cause the most issues. Swiping in from a screen edge is the main way to activate operating system functions: from the right to get the main OS menu, top and bottom for the application's menu bar, left for running applications. Short swipe in from the left pops the last used application from the stack of running apps (similar to Alt-Tab). In this context the entire Desktop interface counts as one app. Long swipe in from the left takes the last used app from the stack and brings up the split screen interface mode allowing you to pin it alongside the current app. Short swipe in from the left then reverse to swipe back to the edge brings up thumbnails of the stack of running apps in a sidebar. Added to this, I found that when using Internet Explorer a swipe from close to the left edge would act as the back button but I found this out when attempting to pan left on a zoomed website. At first I was very confused and it took a fair bit of experimentation to figure out exactly what was going on. I'm sure that if you can get used to these gestures it's OK but the differences between them seems quite subtle to me which makes them easy to get wrong. Orientation change is slow and clunky which is annoying if you trigger it by accident but - given the aspect ratio, the centre of gravity and the keyboard - it's much easier to use in landscape mode and lock the orientation. Some of the built in applications seem to have an orientation override of their own which, to me, is always a sign of a badly designed app. The on-screen keyboard is good and benefits from the wide screen, it's good enough to touch type on at reduced speed compared to a physical keyboard. The screen is too wide to use the keyboard comfortably with two thumbs but there is a split keyboard that does an admirable job in this situation. Finally there's a hand writing recognition mode which I found slow and inaccurate to the point of being useless. Whilst the on-screen keyboard works well with the Tiled interface there are issues with it on the Desktop. Apps aren't designed to work with an on-screen keyboard so, if the input area is in the bottom half of the screen it is masked by the keyboard. There is also an on-screen keyboard that is part of the legacy accessibility settings from Windows 7 but, while it shares the same appearance as the main touch keyboard, it takes precedence over it. Whilst I can see why this might have been left in for devices without touch I would have expected much better integration when touch is available. I know Windows update is normally slow but the first set of updates that it wanted to install out of the box took well over an hour. It then needed two further restarts before all updates were installed and still said there were four updates that would be installed in the next maintenance window. This is where the Surface RT really falls down - the range of applications is severely limited due to the Arm processor and even Chrome and Firefox don't have versions for this processor. There are a number of apps in the store but these seem to be basically web apps that have been skinned to work as full screen system apps, some - such as Dropbox and Twitter - have less functionality than the standard websites. There is a full copy of Office 2013 RT on the device but it only has a Home or Student licence which makes it unsuitable for business use. Office will only run on the Desktop interface. Internet Explorer 10 behaves differently between the Tiled and Desktop interfaces but that deserves an article to itself. I really can't see a good reason to buy a Surface RT, mostly due to the lack of available applications and the fact the hardware doesn't really stand out. If you want a hybrid tablet-laptop then the Asus Transformer is much better as a tablet and as a laptop. If you are after a laptop then you will be much better served by finding a small and lightweight model, even if you get one with Windows 8 and a touch screen, I can confidently say it will be better than this. There are more details of the Surface RT in my device lab. The hybrid tablet-laptop form factor of the Surface requires a layered approach to website UI design.